So, with that, it’s onwards and upwards for 2018 – enjoy! Well, as usual I will start with a comment on the weather. Last month I said we were waiting for our super summer to arrive. It now has and it has been really super apart from one storm which lasted for two or three days with pretty strong winds. In fact, this year we have used the pool more than we have over the past few summers. However, things are drying out now and I’m sure most people feeding animals and tending market gardens would appreciate a few solid rain showers – here’s hoping rain, forecast to be delivered as Rural Living went to print, has come about! Of course, it has also been perfect weather for hay-making with many landowners able to make an early start while some have even harvested two crops. On the other hand, the weather seems to have encouraged a larger number than usual of rabbits! According to Paul Martin who, back in 2006, published a book, Lifestyle Farming in New Zealand, the main mammalian pest in New Zealand is the bushtail possum closely followed by the rabbit. Rabbits were first released here by European settlers in the 1850s as emergency rations and sporting game. The rabbits had no real predators and, in a short time, numbers were out of control. 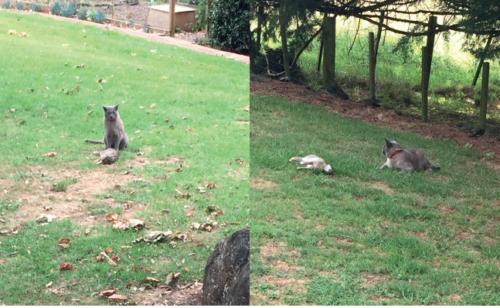 I read recently that it is the duty of all Kiwi landowners to rid their properties of rabbits and possums so for further information on how to go about this, I suggest contacting Rural Living’s pest control correspondent, Ditch Keeling from Coastal Pest Solutions. Discuss with him any problems or the need for help. At home, our rabbit control is largely left to our five-year-old Burmese cat, Sonny Bill or Billy for short. He has been killing and eating a rabbit every two or so days – as many as four a week. He usually brings them inside and takes them to an upstairs bedroom where he gets under the bed for his feast, eating the head first and leaving the ears before devouring the rest. Our cat, Billy, has no trouble downing rabbits not much smaller than himself. It takes Billy an hour or so to get through his meal and, as well as leaving the ears, he leaves the feet, eyes and stomach contents. We have to check regularly to ensure all leftovers are removed – he’s quite a remarkable cat! Once again it’s time for the thoroughbreds and standardbred yearling sales. Last month Rural Living interviewed Tony Dickinson from Waiau Pa, one of our leading breeders for the harness racing industry. A few days back I visited Tony’s property where his yearlings were being shown to buyers, many from the South Island. I must say they looked in great condition and should attract lots of interest at the February 12 sale. Last month we also chose the winner of our ‘name the foal’ competition but as yet we have not received confirmation from Harness Racing New Zealand to say the name is all okay. We have checked that there is no other horse with the same name so we are confident Willsherocknroll will be her registered name. And with that, it’s time to head for the pool. See you next month.